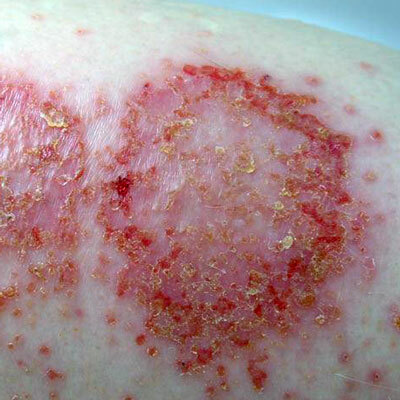 Dermatitis refers to inflammation of the top layer of skin. Eczema is a term based in Greek that refers to a “boiled over” appearance. This refers to eczema or dermatitis that occurs in a predisposed individual. There is often a family tendency toward eczema, hay fever, or asthma in one or both parents. It usually affects infants, and steady improvement with age is typical. However, some children never do outgrow it and it can persist into adulthood. In a small number of patients, it doesn’t manifest until adulthood. People with atopic dermatitis have skin that is very easily irritated by all kinds of substances in the environment. Food allergy is often blamed for eczema, but published trials fail to show any significant association and there is no evidence that supports the effectiveness of food elimination diets (although these diets are quite effective at causing nutritional and growth problems). Allergic contact dermatitis occurs when someone develops an allergic reaction in the skin toward a substance their body comes into contact with. Poison ivy is the most dramatic example of this. After a single exposure, nearly everyone develops an allergy with a profound rash. Another incredibly common example is the reaction many people have to cheap jewelry. This is an allergy to a metal, usually nickel. However, most people never become allergic to nickel, and even when nickel allergy develops it is seldom as bad as poison ivy. Most allergic contact reactions are more like the nickel type of reaction. Importantly, these reactions develop to “stuff” that your skin comes into contact with, so the common sources are skin care products, creams, lotions, makeup, shampoo, etc. Common culprits are fragrances, dyes, preservatives, parabens, and formaldehyde substances. If you work in an industry such as printing, rubber making, or construction there are also a variety of other substances that you might be allergic too because you are exposed to a variety of industrial materials. This is an irritation of the skin that usually comes from one of two things. First, and probably the most common, is irritation from excessive handwashing. Sometimes this is a manifestation of obsessive-compulsive disorder, but much more often it is an occupational hazard seen in medical assistants, hygienists, dentists, doctors, nurses, care attendants, etc. It may also be seen from contact with anything that you might imagine being really irritating to the skin (cement mix, gasoline, paint thinner, etc). 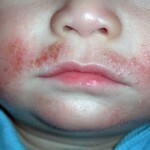 Treatment of eczema or dermatitis is dependent on the type and severity of the eczema. It is highly dependent on the context and Dr. Arlo Miller or Suzi Miner PA-C will work with you to get to the bottom of the cause whenever possible and develop a plan for treatment. If allergic contact dermatitis is suspected, they may recommend patch testing to find out what substance is causing your symptoms.